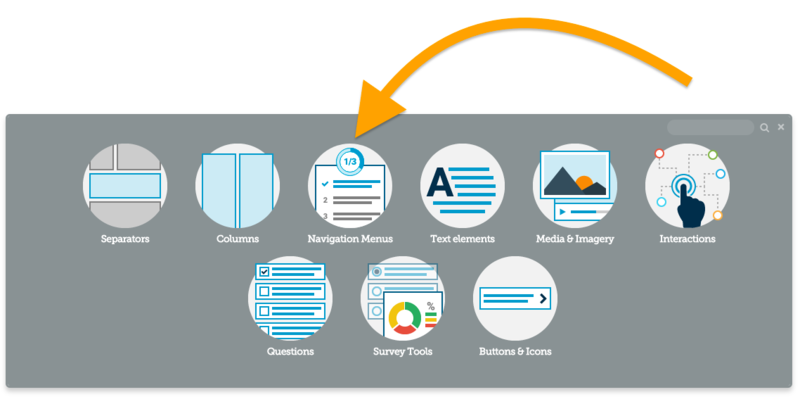 Click one of the orange ‘Add here’ buttons to select a position for your Page Progress part. The Dotted Menu can be placed in a variety of positions on your screen, if you choose ‘Inline - Left Aligned’, ‘Inline - Right Aligned’ or ‘Inline - Center Aligned’ the menu will scroll with your content and be aligned to it accordingly. If you choose ‘Fixed to Left Side of the Screen’ or ‘Fixed to Right Side of the Screen’ the menu will remain always be present on screen fixed to either the left or right of the page. This Part will not display page names, so is a great option if you have several sections or very long section titles. The Horizontal list Menu will display the names of your page sections, it will take up the full width of the section that you add it to. By default the Horizontal list Menu will scroll with your content, if you choose the ‘Stick to the top of the screen’ Variation in Layout Designer the menu will always be visible on screen. By default the Horizontal list Menu will also change to a dropdown menu at Tablet view mode (in order to save space) you can configure this option using the ‘Convert to Dropdown’ Variation in Layout designer. The Vertical list Menu will display the names of your page sections as a stacked list. By default the Vertical list Menu will scroll with your content, if you choose the ‘Stick to the top of the screen’ Variation in Layout Designer the menu will always be visible on screen. By default the Vertical list Menu will also change to a dropdown menu at Tablet view mode (in order to save space) you can configure this option using the ‘Convert to Dropdown’ Variation in Layout designer. The Stepper Menu will display the numbers of your page sections as a list, this menu can also be set to remain on your page at all times using the ‘Stick to the top of the screen’ Variation in Layout Designer. 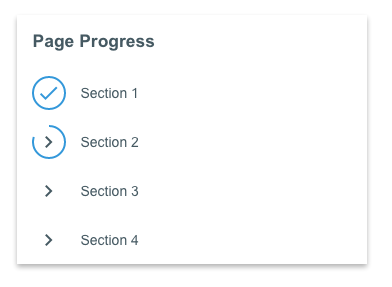 The Stepper Menu will display a simple progress bar that shows where the learner is and which pages they have completed but does not show the name or page number.